coiled elements, with five (the common number in living species) established by the Pennsylvanian (Peck and Eyer, 1963). 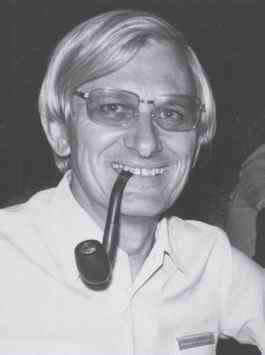 The evolution of modern forms has led to the elimination of the apical pore as a result of the tighter association of the spiral cells at the apex (Grambast, 1974) (FIG. 4.27). Charales. The only Paleozoic family containing utricle-producing and utricle-free species is the Moellerinaceae (Silurian-Permian), which has been interpreted as occupying a central position in the early phylogeny of the group. 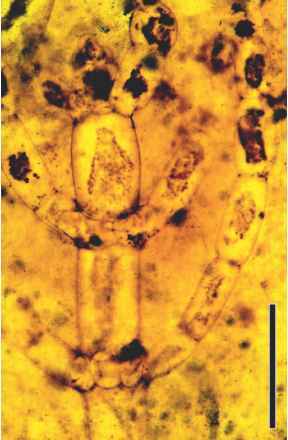 In addition to the large number of fossil gyrogonites that have been described and used as index fossils, the vegetative parts of many fossil charophytes are also known. Two genera have been reported from the Upper Devonian of South Africa (Gess and Hiller, 1995). In Hexachara (FIG. 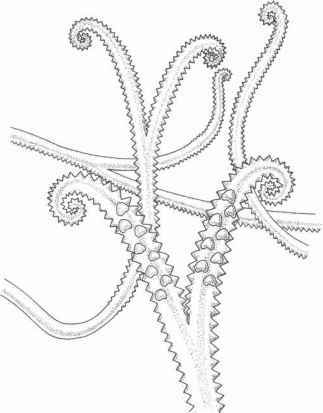 4.30A) each node produces a whorl of six laterals, and oogonia are produced on each lateral, whereas in Octochara (FIG. 4.3 0B) a whorl of eight laterals are borne at each node; each lateral is branched and produces an oogonium. small cells. These tubular cells are similar to rhizoids in living Charales. Uncalcified oogonia found associated with P. cranii axes (but not in organic connection) are composed of six sinistrally spiraled cells with an equal number of coro-nula cells arranged in a single layer around an apical pore (Kelman et al., 2004). The shape of the oogonium is reminiscent of the extant Chareae, whereas the morphology of the thallus is similar to that of the Nitelleae. Another species, P. tarafiyensis, comes from the Upper Permian of Saudi Arabia (Hill and El-Khayal, 1983), and P. vermicularis has been reported from the Lower Cretaceous of Spain, along with three other charalean fossils (Martin-Closas and Dieguez, 1998). One of these, Charaxis spicatus, closely resembles members in the extant genus Chara, whereas the other two have been assigned to Clavatoraxis, a morphoge-nus created for sterile, verticillated clavatoracean (family Clavatoraceae) vegetative remains that cannot be attributed to any species of gyrogonite. The Clavatoraceae is a large group of exclusively Mesozoic Charales that has frequently been used in biostratigraphy of continental facies (Martin-Closas, 1996). 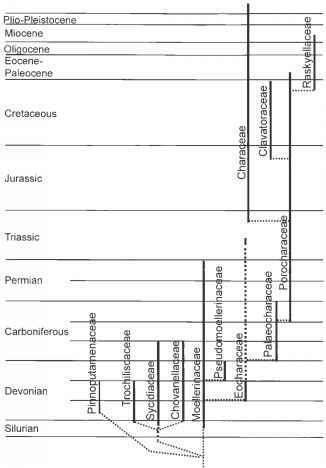 They are known from the Oxfordian (Upper Jurassic) through Cretaceous of all continents except Australia and Antarctica, based on both fructifications and vegetative parts, often in organic connection. Clavatoracean fructifications are composed of an oogo-nium surrounded by a calcified utricle. Utricles are important as characters in species identification as they underscore morphological variability. The Clavatoraceae shows development of utricles similar to those in Paleozoic sycidialean families, and this is interpreted as being a result of similar external constraints, rather than expressing true phylogenetic relationships (Feist et al., 2005a). Fossils of the clavatoracean genus Clavator (Jurassic-Cretaceous) consist of strongly calcified stems with narrow internodes and six lateral branches in each whorl. Oogonia are located in a single vertical row on the adaxial side of a branch, one per node. 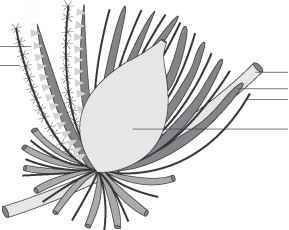 The vegetative parts of another genus in the Clavatoraceae, Echinochara from the Morrison Formation (Jurassic) of North America, are known in some detail. The plant body consists of 12 dextrally spiraled, cortical tubes constructed of elongate cells arranged in a linear series. At the distal end of each cortical cell are five long spines. Oogonia were produced in whorls of six. Thin sections of chert from the Middle Devonian of New York revealed both marine and freshwater algae (Baschnagel, 1966), including a representative of the Zygnematales (or conjugate algae). Paleoclosterium leptum is formed of solitary, elongate, lunate cells <46 pm long and 5 pm wide that appear morphologically similar to species in the extant genus Closterium. Another fossil member of the conjugates is Palaeozygnema spiralis, which occurs in Cretaceous amber from southern Germany (Dörfelt and Schäfer, 2000). This fossil has unbranched chains of cells, each <20 pm long by 14 pm wide, in which chloroplasts and zygotes are exquisitely preserved. Palaeozygnema (FIGS. 4.32, 4.33) is similar to the modern genus Zygnema, although the process of game-togenesis is apparently different in the fossil. Zygnematacean zygospores reported in palynological samples have been useful in assessing changing depositional environments (Zavattieri and Pramparo, 2006). Does placenta protect zygote from desiccation in charophytes?